GRANDER water products are filled with information water; the revitalisation of “your” tap water takes place by a transfer of information. Equipment can be installed directly into the main water supply line or can be mounted indirectly after the water supply line is laid. Grander Water Technology is the leader in water revitalisation, using the principle of nature without chemicals or electricity to give you – the ultimate in healthy water. Water is the single most important substance; if you do not have water you do not have life. bIt is the driving force behind all the various environments and ecosystems that make up our world, in fact it regulates all weather systems. Life depends on water for virtually every process, its ability to dissolve many other substances being its most essential quality*. Water must have the ability to clean, absorb, and transport any other substance. This ability is affected by pollution and environmental influences. It is Johann Granders passion to restore water so that every person has access to good quality drinking water that is why he developed Grander Technology. While there is still no conventional scientific explanation of how the Grander Technology process works, many studies have shown profound consequences through the use of Grander Technology. Sometimes we can not explain why we know something is right, we just instinctively know. Grander is a unique sustainable technology that uses no artificial processes to revitalise water: putting nothing into water and taking nothing out. Grander Technology may help you drink the recommended 2-3 litres of water to prevent dehydration, which has been linked to constipation, increased risk of bladder, prostate and kidney problems. Pollution causes water molecules to gather together in larger clusters than it would naturally, as the water “wraps up” (dissolves) the pollutant. Even if the pollutant is filtered the water molecule cluster still remains in an unnaturally large cluster due to its lasting electromagnetic frequency influence on the water, this frequency keeps the water molecules in the same unnatural structure, as they were when the pollutant was present, despite its absence. This is the pollution no one considers. Water pollution comes in many forms, chemicals, farm run-off, Thermal, frictional and electromagnetic. Even methods or devices that we typically attribute with the removal of pollution from water are themselves contributors to water pollution on the molecular/frequency level. Pollution saturates water with unnatural amounts of substances and electromagnetic influences, that all leave their influence in the form of frequency on water, reducing its capacity to dissolve and transport nutrients, food and oxygen and also to clean the cells within our bodies.In the larger environment waterways no longer function as they should, because pollutants cause unbalancing of ecosystem nutrient and energy cycling. As water becomes over polluted it can no longer clean or regenerate itself, it is simply too full of the frequency influence of pollution, causing larger than natural water molecule clusters. If water cannot dissolve and transport oxygen effectively it can become anaerobic. If this occurs in any environment, it also may become anaerobic. 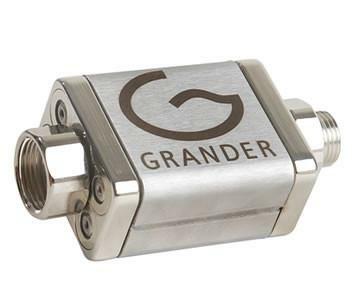 The Grander Flexible is designed to suit your changing needs. Whether it’s a shower, kitchen or travel system the Flexible can be easily removed and refitted – even to your homes washing machine. Ideal for home use and travel. Portable, comes with fittings to mount quickly and easily to taps, showers, washing machines, and garden hoses.